The first in a projected series of plays from around the UK, Contemporary Scottish plays is also the latest anthology to celebrate Scottish playwriting: from the seventies, A Decade’s Drama and Plays of the Seventies; from the eighties, Scot-Free; in the nineties, Made in Scotland and Scotland Plays. Canongate produced a doorstopper volume (Craig and Stevenson, 2001) spanning the twentieth century from J.M. Barrie’s Mary Rose (1920) to Chris Hannan’s Shining Souls (1996). 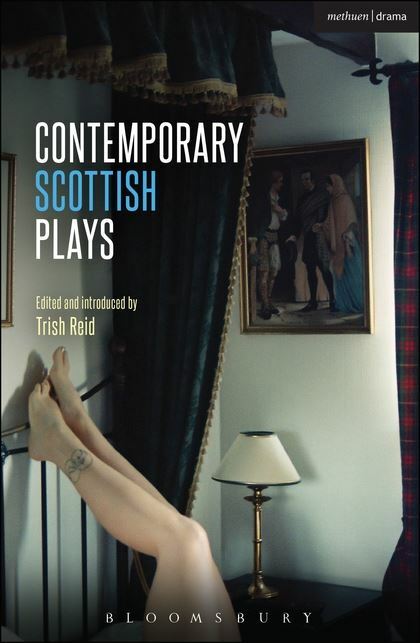 Trish Reid now updates this Caledonian canon by presenting recent plays from 2009 to 2013, although she takes pains to note that her volume ‘lays no claim to be a “best of” selection’ (p.ix). Bullet Catch is essentially a magic show that relies on a different audience volunteer for each performance… the text is never the same for each reiteration of the performance (Overend, 2014, n.p.). Drummond’s script is therefore less a blueprint for performance than an amalgam of reactions by many volunteers, and a wry commentary on the ‘magic’ of the theatre. For example, the script does not explain how a particular levitation trick is achieved, although the actor does so in performance. The reader is kept in suspense, simultaneously privileged and disadvantaged by a calculated instability between Drummond’s written word and his performative act. It is rare to find a script that subverts so overtly and wittily the reading of a play. Morna Pearson takes her title The Artist Man and the Mother Woman from Shaw’s Man and Superman, asking like him, ‘Which shall use up the other? That is the issue between them’. This interest in power relations, especially in competing nationalisms, perhaps defines the entire volume. It may be mischievous to compare Edie and Geoffrey to England and Scotland, but their twisted incestuous dynamic bears more than a passing resemblance to the characterisation of a divorcing couple or dysfunctional family propounded in the UK media in September 2014. They propose a nation that is never static, always in process, proud of its heritage as well as its increasing heterogeneity and, above all, one that can surprise and provoke engagement beyond the confines of a restrictive and potentially damaging nationalism (2003, p.39). Hurley and his collaborators, all potent voices in the Yes campaign, present a rousing patchwork of song and monologue which nods to McGrath while extending his socialist legacy into a new century. Politics, popular culture, internationalism and satire slide into and around one another, creating an intoxicating brew but steering clear of agit-prop. To an extent, Narrative exists at a remove from the other scripts. The least obviously ‘Scottish’ of the collection, having premiered at the Royal Court with a mainly English cast, and written by Scottish-born Anthony Neilson (now resident in London), it challenges traditional conceptions of narrative, for example by killing off characters at random. Plot and story are shown to be nothing more than attempts to add coherence to an incomprehensible universe. What Scotlands emerge from these plays? Variously described as ‘too poor. And too small’ (p.15), ‘filled with wickedness and abominations’ (p.106) and ‘this big funny mongrel’ (p.345), Scotland is a country that disappoints and inspires in equal measure. These are not state-of-the-nation pieces, but each speaks to a contemporary understanding of Scottishness, particularly in terms of power and status. Perhaps the most fascinating characters are Evelyn in Artist Man… and Shona in Rantin’—both teenage supermarket employees in small towns, and both seeking an escape from drudgery through alcohol. But where Evelyn appears to meet a sorry end, Shona’s adoption of Luddism as a response to human obsolescence provides a bracing and hilarious example to the spectator. Reid’s selection of plays hints at the current strength of Scottish new writing, supported by companies and venues around the country. Her claim of a ‘golden age’ (p.ix) may sound like hyperbole, but on the evidence of this volume, theatregoers and artists alike have every reason to feel optimistic. Contemporary Scottish plays will inevitably become a chronicle of triumphs past, like the texts that precede it, but it is to be hoped that at least a few of these plays will come to define early twenty-first century theatre. Archibald, D., 2011. History in contemporary Scottish theatre. In: I. Brown, ed. The Edinburgh companion to Scottish drama. Edinburgh: Edinburgh University Press, pp.85–94. Brown, I. and Fisher, M. (eds. ), 1994. Made in Scotland. London: Methuen. Cameron, A. (ed. ), 1990. Scot-Free. London: Nick Hern. Craig, C. and Stevenson, R. (eds. ), 2001. Twentieth-century Scottish drama: an anthology. Edinburgh: Canongate. Findlay, B. (ed. ), 1998. Plays of the seventies. Edinburgh: Scottish Cultural Press. Holdsworth, N., 2003. Travelling across borders: re-imagining the nation and nationalism in contemporary Scottish theatre. Contemporary Theatre Review, 13(2), pp.25–39. http://dx.doi.org/10.1080/920087167. Howard, P. (ed. ), 1998. Scotland plays. London: Nick Hern in association with the Traverse Theatre. Overend, D., 2014. Dramaturgies of mobility: on the road with Rob Drummond’s Bullet Catch. Studies in Theatre and Performance, 35(1), pp.1–16. http://dx.doi.org/10.1080/14682761.2014.985011. Wright, A. (ed. ), 1980. A decade’s drama: six Scottish plays. Todmorden: Woodhouse Books. Ben Fletcher-Watson is a doctoral candidate at the Royal Conservatoire of Scotland and the University of St Andrews. His research examines Scottish performing arts for the very young, as well as the links between children’s theatre and mobile technology. He has been involved in the development of several digital products inspired by theatre and music, including White: The App, VM Fireworks and Secret Suitcases. He is currently editing a selection of scripts, Visual Theatre for Children (Intellect, 2016).